Dogs’ toe nails grow quickly, and oftentimes clipping those nails can be stressful both for your pet and for you as well. So, here are some of the best dog nail clippers that we could find for dogs of all sizes. 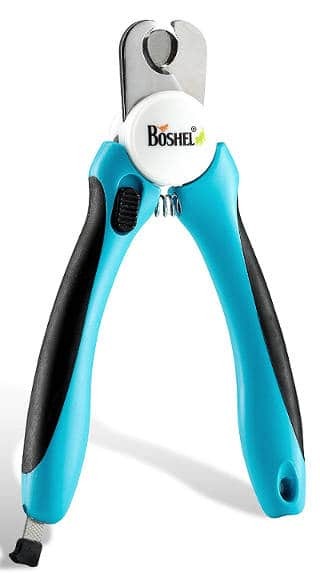 The Boshel dog nail clippers are sturdy and sharp with stainless blades and a safe guard to avoid over cutting your pup’s nails causing discomfort. There is also a nail file inside of one of the ergonomically designed handles which can be removed and is useful for smoothing the nails after clipping. The handles themselves are sturdy and easy to grip. The safeguard prevents from cutting into the nail quick. Works nice on elderly and nervous dogs who don’t like to have their nails clipped, and they are easy to use for first time users. 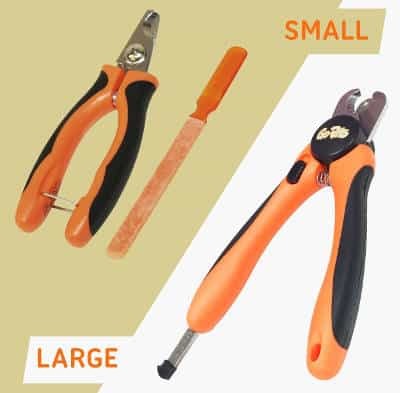 These orange and black clippers are designed for small or large dogs and cats as well. They have stainless steel blades, a sensor safety guard and non-slip coated handles. They cut nails cleanly and they are sturdy and solid. It is good to know that the company offers a portion of their profits to animal charities and this product is followed by an unconditional refund or replacement guarantee. These clippers are sturdy and well constructed. 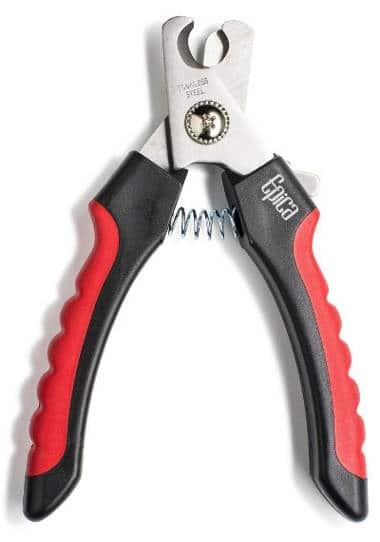 The Nail guard prevents over clipping. The non-slip handle makes clipping your dog’s nails more secure. This tool makes quick and precise cuts. Some dogs are so afraid of having their nails clipped that clipping those nails is impossible. This nail grinder grinds off the pets´ nails easily and safely. It has a comfortable handle and 3 different ports to accommodate small, medium and large pets. 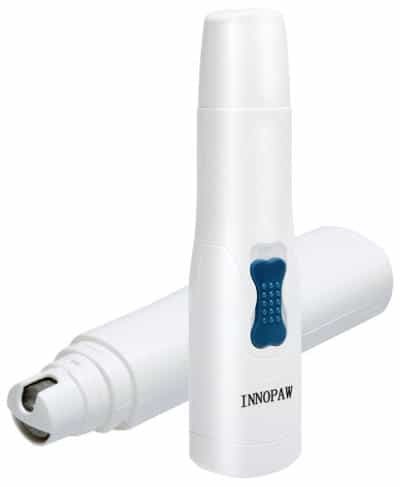 The Innopaw grinder works on 2AA batteries and has a rechargeable emery wheel. Often works well on pets that fear nail clippers. Is a well made good quality product. 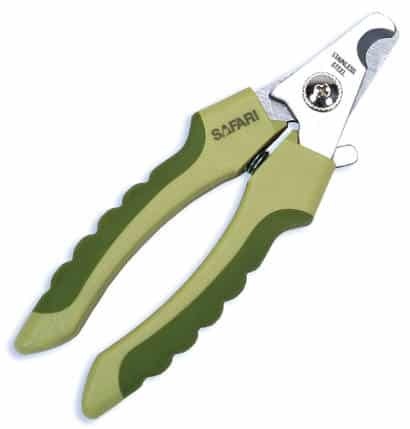 The Safari Professional Nail Trimmer comes in sizes small, large and a small-medium 2 pack. It is more suitable for medium to large dogs. These clippers have a safety stop, stainless steel blades and a claw guard. They work best if nails are cut immediately after your dog is bathed and the nails are softened. The small size can be used on cats as well. Easy to hold and to control. This Millers Forge Quality nail clipper is a heavy duty clipper with stainless steel blades that cut from both sides. It is designed and recommended for dogs that are more than 40 pounds. It cuts quickly and effectively, and has a lock closed when not in use. The sharp blades cut your dog´s tough nails quickly and effectively. Large handles allow for a more secure grip. 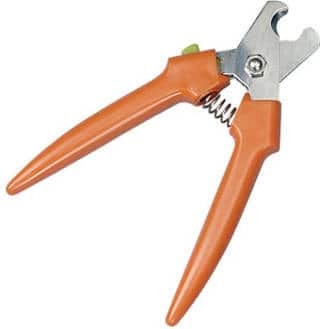 The Wagglies Professional nail clippers have an ergonomic rubber handle for a better grip as well as sturdy stainless steel blades and an angled head. There is a sensor guard to help prevent from cutting the nails too far back and provide provision trimming as well as a safety lock to keep your clippers closed when not in use. This product comes with a nail file, a free grooming e-book guide and a 100% complete refund guarantee. These clippers are sharp resulting in a faster cut. The angled trimmer head makes cutting easier. Helps cut nails correctly even for the inexperienced. The Epica Professional Pet Nail Clipper comes in sizes small/medium and medium/large. It has semi-circular blades allowing you to see exactly where the nails are being cut. The blades are also sharp stainless steel and there are locks when the clippers are not in use. This tool has non-slip rubber handles and comes with a lifetime warranty. It cuts quickly and effectively. Sharp blades cut through thick nails. Guide to help with cutting. Feels comfortable to hold and to use. 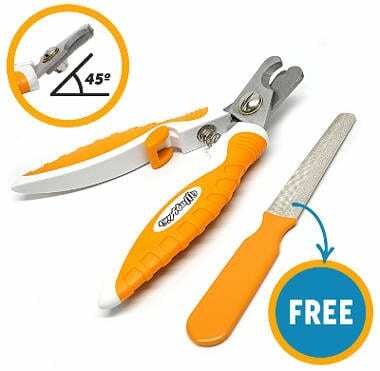 In conclusion, finding the right pet tool is essential to cutting your dog´s nails properly and easily, so the best dog nail clippers in this review can help you find the right pet trimmer for your loving dog.